Immerse yourself in the rich heritage of the UK and Ireland - visit historic cities, famous English castles, Welsh castles and majestic cathedrals, or admire ancient archaeological sites, world-class museums and sumptuous palaces. The UK and Ireland's rich history has been enticing travellers from around the globe for centuries with many people travelling just to visit famous english castles. Thousands of years of stories are told through the rich tapestry of cities, castles and cathedrals going back as far as the Roman Empire and beyond. Stonehenge, for example, is a prehistoric site in south west England which dates back almost 5,000 years! And remember that Royal Oak members benefit from free admission to National Trust properties in the UK. Wales alone has over 400 castles to be explored! Caernarfon Castle in North Wales, for example, is one of the best preserved medieval fortresses in Britain, and formed part of King Edward 1's famous 'ring of steel' - a chain of castles built in the 13th Century to subdue the Welsh population. Strata Florida (pictured below), which translates from Latin as Vale of Flowers, is the romantic ruin of a former Cistercian abbey, founded in 1164, near Tregaron in mid Wales. This is just one of many historic buildings in Wales that are calling out to be explored! Ballindalloch Castle is one of the finest surviving examples of a Scottish Baronial Castle and tourists flock from around the globe to visit this 'Pearl of the North', located between Aberdeen and Inverness. 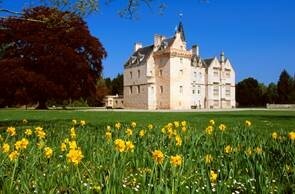 Brodie Castle in Moray, North East Scotland, is a fabulous 16th century castle with Jacobite connections, which boasts a 71 acre estate containing landscaped gardens and the national daffodil collection. Known to many as the ‘Father of the National Parks’ in the USA, John Muir was born in Scotland and spent the first 11 years of his childhood there. Why not follow in the footsteps of John Muir on a tailor-made tour with Janet Redler Travel & Tourism? England is also famed for its castles and palaces, so what better way to explore over 1,000 years of history with a tour of its royal buildings? The beautiful Queen's House in Greenwich, London, famous as the first Classical style building in England, re-opened in 2016 after a major refurbishment and is well worth a visit. Explore Roman Britain - Britain is well known for its wealth of Roman remains and artefacts, which date back to the beginning of the first millennium AD. From the well-preserved Roman baths of Aquae Sulis (now the city of Bath) to Hadrian’s Wall near the Scottish border, a tailor-made tour of Roman Britain with Janet Redler Travel & Tourism will take in the country's most significant Roman sites and treasures. Oxford, pictured above, is a beautiful city of stunning architecture, history and culture. You’ll find ancient and modern colleges, fascinating museums and galleries, and plenty of parks, gardens and green spaces in which to relax. York in the north of England is one of England's greatest cities, which dates back to Roman times and was once a major Viking settlement. York has long been the second seat of the Church of England after Canterbury. King Arthur is one of Britain’s greatest legendary figures, with his origins lost in the mists of time. The mythical king, who many think could have been a real person, is associated with numerous landmarks across the country. Enjoy a tailor-made tour exploring King Arthur's Britain with Janet Redler Travel & Tourism, discovering the sites and locations linked to Arthurian legend. Salisbury Cathedral in England is home to the best surviving of the four original copies of Magna Carta, one of the most important documents in the world, which was signed by King John in 1215 and is considered as one of the first steps towards democracy. The cathedral, which also boasts the tallest church spire in the United Kingdom, is one of the finest examples of Early English architecture. Discover the history of the UK and Ireland through its archives, collections and manuscripts on a tailor-made tour with Janet Redler Travel & Tourism. The Book of Kells at Trinity College Dublin is one of the most famous manuscripts in the world, but there are many other historical documents which shed light on the fascinating history of these countries. Why not take a location tour of your favourite TV and movie dramas filmed in Britain and Ireland? Step back in time, for example. to explore the lives of the English aristocracy and their servants in an Edwardian country house or view the spectacular scenery of Northern Ireland as seen in the well known series Game of Thrones®. Or how about enjoying a tailor-made heritage tour to discover Ireland's ancient east? Ireland’s ancient east boasts the earliest evidence of human settlement in the country and an abundance of historical sites that enable visitors to trace the development of civilisation, society and religion in Ireland. The human story of Britain and Ireland goes back thousands of years and there are dozens of ancient sites to visit and explore. From hill forts to henges and stone circles to burial chambers, a tour of ancient Britain and Ireland with Janet Redler Travel & Tourism will unearth 5,000 years of history for you or your group. There is so much to see on a luxury vacation to the UK and Ireland - browse our website or contact us directly to find out more about the range of luxury tours we offer, which can be tailor-made to meet your needs.